With Halloween looming, I have parties and gatherings on the brain! I am from a large family and gatherings often involve drinking some wine. My mother is in constant motion, as are most of the ladies in my family at these events, so wine glass get moved or “zambonied” as we call it. In other words, people are always clearing the ice so to speak. One of the first casualties is often glasses! A wile back, I bought the family a set of wine charms and well. They work like a charm! Now, our family has grown and we need more! So what’s a crafty girl to do? Make some of course! I have been cleaning like a maniac lately and came across a stash of buttons and beads. Together with some stretch cord, I set out to see what I could come up with! First on was the button. Since the cord I chose was thicker, in anticipation of some wine wobbly hands manipulating them, I wanted to tie the cord behind the button. I sort of knew it would be big. 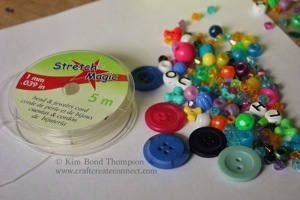 Next on we’re the beads. 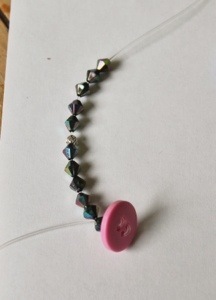 You need a minimum of about 2 inches of cord to get around the wine glass base when stretched… So add those beads! Finally, using a double knot, I tied off the cord behind the button. Then, I added a drop of super glue onto the knot for good measure. When dry, clip the cord. VOILA! Super quick project to personalize a shower or holiday party! They would be a cute teacher gift too! Would you like to see this project as a kit that you could make without all of the collecting of materials? Leave a comment below and tell me how you like to craft! 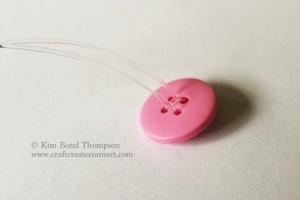 Maybe you like the feel of craft, without the work… aka… Hit “buy.” Would love to hear that too :). That is such a good idea! 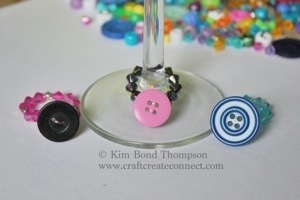 Two or three years ago I made wine glass charms for everyone for Christmas. I made them from metal rings and findings and within a very short time they had all tarnished and oxidised – which was really disappointing! 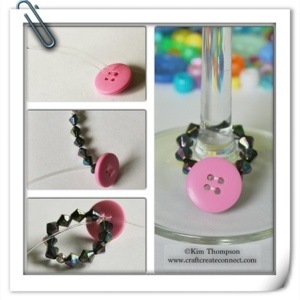 Using buttons and elastic is just so practical and clever! That is exactly what we found too! Soooo… plan B! I think these guys will be around for a while! They’re so cute. I’m definitely the do-it-myself type. The process is almost as fun as the finished product. I think so too! 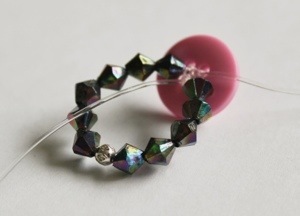 I think most of the time I make stuff, I end up giving it away!